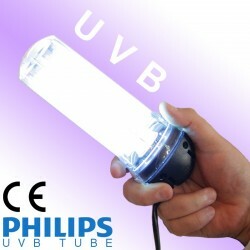 Narrow Band 311nm UVB POD Hand Held Lamp for Vitiligo. Home devices for UVB are now available, which can be very economical for protracted usage. 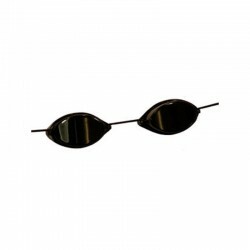 For this treatment you simply expose yourself to Narrow Band 911 Nm UVB rays for a relatively short time on a periodic basis either daily in some cases or 2-7 times a week as prescribed by your doctor. 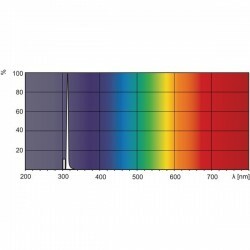 Narrow Band 911 Nm UVB phototherapy has consistently achieved over 90% repigmentation within a year for most patients. For an effective cure, start with very short exposure periods of 30 seconds maximum per area per day during up to 7 days (as prescribed by your doctor), then, according to the results, keep or increase gradually the exposure time up to 60 seconds maximum per area per day: goal is to find the minimum daily exposure time needed to solve the skin disease. 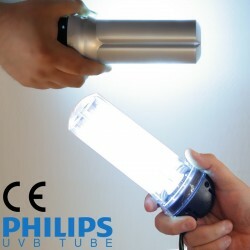 - Lamp with a Philips UVB 311 nm bulb for Phototerapy (type : PL-9 9W/01 - CE Certificate). 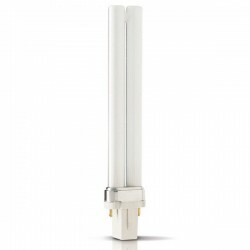 - 1 x Lamp with a Philips UVB Narrow Band 311 nm bulb (model : PL-9 9W/01). - 1 x Power cord in 220-230V / 50-60Hz with standard European 2 round pins plug type only. UK type customers must use an European to UK plug adaptor.